Perkins Hill Park	Perkins Hill is located in the McKinley neighborhood and features well-kept green spaces, picnic areas, a basketball court and totlot playground. 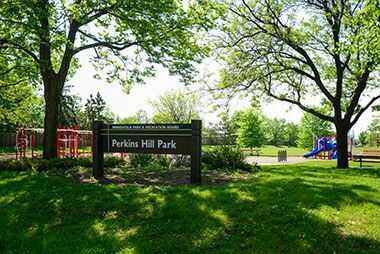 Name: The park’s name comes from the Perkins Hill Addition in which most of the park is located. The name has never been formally adopted. The five-and-a-half-acre park was acquired in 1948 for $276. All but two lots of the park were acquired from the state at no cost. The two additional lots were purchased. The state had obtained the property through tax forfeiture. Perkins Hill Park along with Bossen Field Park and parts of Peavey, Kenny and McRae parks were acquired in the late 1940s from the state’s list of tax-forfeited property. The neighborhood had been targeted for a playground by a 1944 study of the city’s park needs. After acquiring the land, the park board promptly vacated 3rd Street through the park and graded the north end of the property for a ball field. The park was intended primarily as a playground for small children. Improvements were completed in 1949 with the installation of backstops for the ball fields and playground equipment and the seeding of the park. Perkins Hill Park shrank in 1969 when 1.8 acres of the park were taken by the state highway department for the construction of I-94 through north Minneapolis. The state paid $74,000 for the land. Almost $40,000 of that money was put into a fund to improve the park and the remainder was put into a land account to purchase other land for parks in the city. Plans to renovate the remaining acres of the park were approved in 1970 and commenced that year. 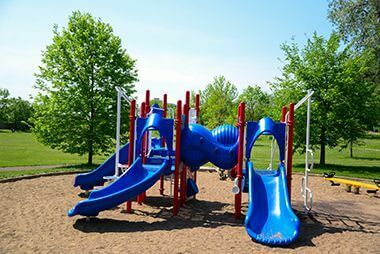 The park was given a makeover in 1990-91 and new playground equipment was installed in 2010. 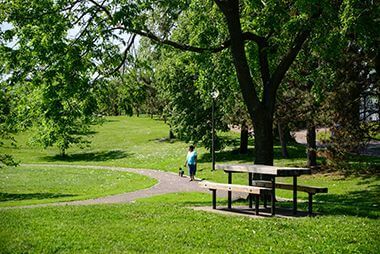 While the Picnic Areas here are a first-come-first-serve basis, the Park Board has several reservable picnic sites to host your birthday parties and other celebrations. Enjoy a shady stroll along Perkins Hill Park's paved walking trails. 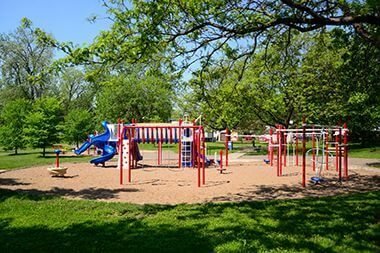 Perkins Hill Park features both a full size playground and a tot lot for the smallest family members. 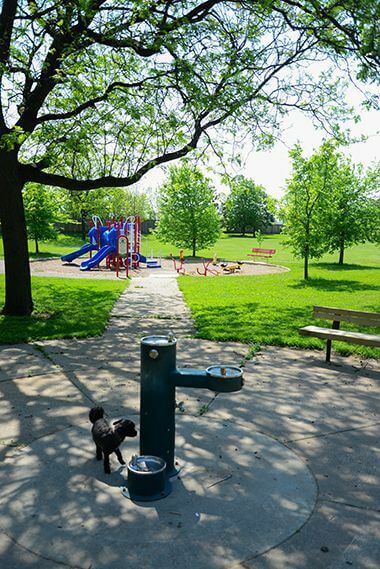 Stop to water yourself and your pet at Perkins Hill Park. Enjoy a leisurely day in the park as the kids enjoy themselves on the playground.